The band Best Coast first entered my field of vision early in my recent vacation, while I was browsing an Urban Outfitters in suburban St. Louis. The store’s music section was very small, and there was only a couple of actual CDs on display, so it wasn’t too hard for the postcard-looking cover of their debut LP, Crazy For You, to catch my eye. Considering UO has already earned my respect with its musical tastes, I figured this album was probably worth picking up. But I wasn’t going to buy sound unheard, and since there was no listening station to be found, I walked away but kept it in the back of my mind. A few days later, before leaving my friend’s abode to experience Portland some more, my e-mail lit up with a Best Coast selection on NPR’s Song of the Day. Two points for Best Coast. So, by the time I got to Jackpot Records later that day and saw the album in the listening station, I made sure to give it a whirl. It’s very reminiscent of the girl groups of the ’50s and ’60s — except that it’s just one girl singing this time. And there’s hardly any production value whatsoever — rather than lo-fi, think no-fi. That being said, it’s not too bad. If Best Coast sounds familiar to groups such as The Vivian Girls or Dum Dum Girls, that’s because the drummer is Ali Koehler, who joined the group in July after leaving the aforementioned Vivian Girls. The band was formed by songwriter and frontwoman Bethany Cosentino and multi-instrumentalist Bobb Bruno. It went through a couple of drummers before landing on Koehler. 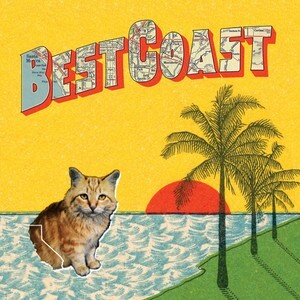 In addition to putting out the album in July, Best Coast has released three EPs and several singles since 2009. To hear more of their stuff, check out their MySpace page. And keep tabs on their goings-on by following their blog.